Follow a number of food bloggers on Instagram and other social media. One of my favorites is theboywhobakes. 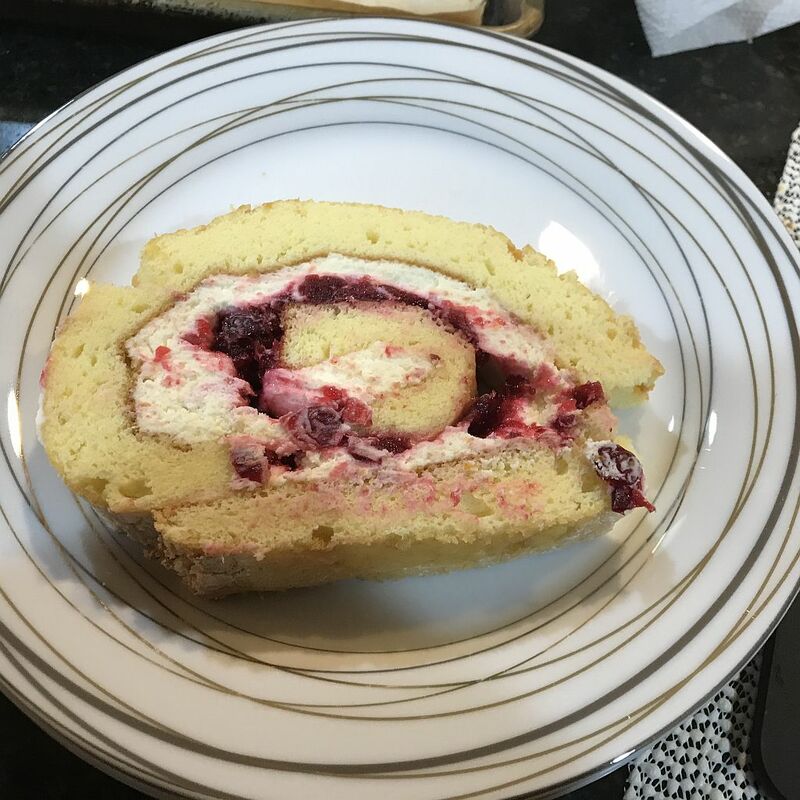 Around Thanksgiving time he posted an roulade (though I think of it as a jelly roll) that looked so tasty I saved the post for a random weekend when I’d be able to examine it further. This was that weekend. I confess that jelly rolls don’t have a good reputation in our kitchen. More often than not then have become the basis for a sweet trifle when they cracked in half during rolling. For whatever reason I was convinced I could make it work. Then I looked at the recipe and was a bit dumbfounded. This looked like no jelly roll cake I’d seen before and I looked away. 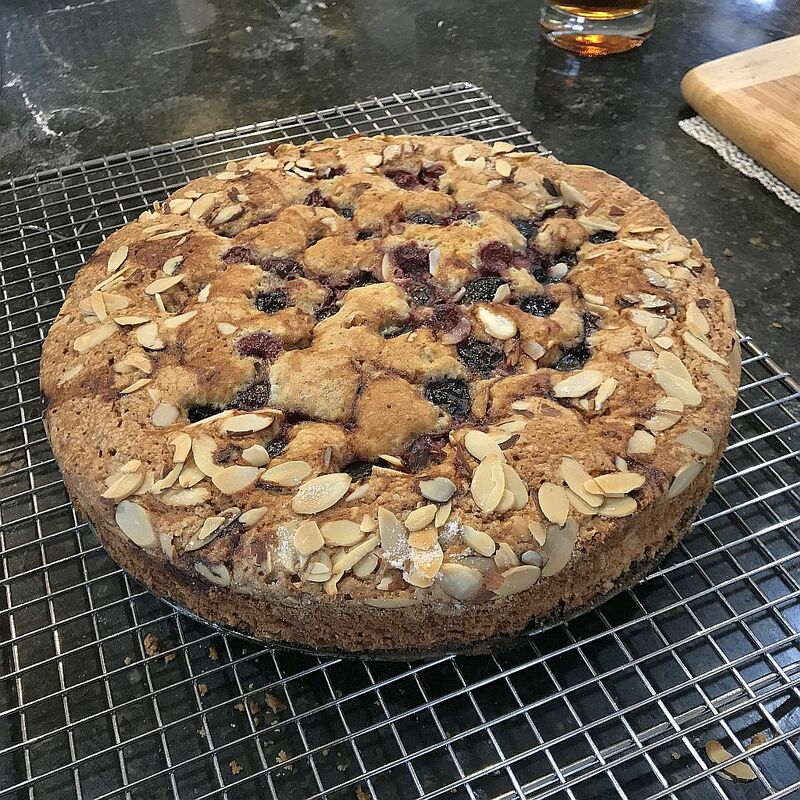 I found a cake recipe I was more comfortable with, tweaked it a bit and went with that. The jelly roll still cracked however it was delicious. Worthy of another try I think. I picked up some fresh blueberries at the megamart and woke Sunday morning with a hankering for scones. Baking with fresh fruit is always a little different from their dried cousins (such as the dried cranberries in these scones), plus I had no heavy cream, so I improvised. Preheat oven to 400°F. Line a 9″ round baking dish with parchment and coat the sides of the pan with baking spray. Whisk together the flour, sugar, baking powder, cinnamon, allspice and salt in a large bowl. Add the butter to dry ingredients. Use a pastry blender to work the butter into the dry goods. After 3-4 minutes or so the butter should be well cut into the dry goods and the dry goods should look grainy. Add 3/4 cup half and half and the egg to the dry ingredients. Use a wide rubber spatula to gently mix the dough until it just comes together. A bit of flour in the bowl isn’t a problem. Add the blueberries and carefully combine them with the dough. Empty the dough into the prepared pan. Press the dough into a 9″ round circle within the pan. Cut the dough into 8 wedges (I use a bench scraper). Brush the dough with the remaining half + half and sprinkle generously with sugar. Bake for 30 minutes, rotating the pan halfway through cooking. The scones are done when an instant-read thermometer reads 205°F when inserted. Move the pan to a cooling rack and allow to rest for 10 minutes. Run a knife around the inside of the pan to loosen the scones. Place a plate on top of the pan and up-end the pan/plate to remove the scones. Remove the parchment and return the scones to the cooling rack for another 5-10 minutes. Serve warm, with a bit of butter or jam. Or allow to cool completely and wrap individual scones in a double layer of plastic wrap to keep for 3-5 days. I think baking these in the pan helped them have a slightly better rise than the free form scones I have made. The fresh berries definitely benefited from the extra sugar. Most scone recipes tell you to blend the butter and dry ingredients until it resembles small peas. No amount of blending has given me that result. When the butter is no longer sticking to your pastry blender feel free to move on to the next step. Searching for a suitable dessert to make for Easter Dinner at my mom’s house is a delicious challenge. While most of us enjoy a chocolate whatever-you-bake special dinners are a chance do something different. I had some cherries in the freezer that I wanted to do something with. An hour lost to the Internet provided several options. In the end I opted for this lovely creation on the right. Our friend G celebrated his birthday this past weekend and IMHO birthdays require cake. He requested a cake of the red velvet variety. After a bit of research I came up with the following recipe. When finished I frosted it with cream cheese frosting for a delicious result. Sadly, despite a whole bottle of gel paste food coloring, this cake did not turn out red. It was, however, a very delicious chocolate cake and I’m pretty sure part of deep chocolate color came from all the red dye. So I updated the name of the recipe and kept the food coloring. Preheat oven to 350°F. Spray a 13″x9″ with baking spray and then use a sheet of parchment paper to create a sling inside the pan. Combine flour, cocoa, soda and salt in a bowl and whisk together. Set aside. Place the sugar and butter in the bowl of a stand mixer and beat on medium-high until fluffy. While butter beats beat the eggs and food coloring together. Add the egg mixture to the butter/sugar and beat until combined. Combine the buttermilk, vinegar and vanilla. Add a third of flour mixture to the butter/sugar followed by half the buttermilk mixture. Beat on low until just combined then repeat with another third of the flour and the remaining buttermilk. Beat again until just combined and add the remaining flour. Scrap the beater and give the batter a final stir by hand. Transfer the batter to the prepared pan and distribute evenly. Bake for 35-40 minutes, rotating the pan 180° half way through cooking. Cake is done when a toothpick inserts in the middle comes out clean. Cool for at least 30 minutes before cutting. Cool for 2 hours before frosting. I used gel food coloring paste in place of liquid food coloring. With a white or yellow cake batter the coloring paste produces a very vibrant hue. Red velvet being a chocolate based cake came out more murky red-brown. I took inspiration from a couple of recipes I found online, which you can view here, here, and here. We celebrated a birthday at a recent Saturday night gathering and, for me, birthdays need cake. The birthday boy’s mom mentioned chocolate chip pancakes as something the 8 year old was asking for so I set out to make a cake that might, in some small way, match the flavor of the griddle cooked treats. I leveraged this recipe from Jen’s Favorite Cookies and then ended up improvising after I realized I had doubled the butter. The birthday boy liked the cake well enough that I hastily scribbled down some notes in the hopes of being able to produce something similar in the future. Preheat the oven to 350°F. Greased the bottom and sides of 2 9″ cake pans. If you have parchment you can also place a parchment round in the bottom of the pan. Whisk together the flour, salt, soda, powder, and cinnamon in a bowl. Set aside. Crack the eggs into a bowl, add the vanilla and whisk until the eggs and vanilla are well combined. Add butter and sugar to the bowl of a stand mixer with a paddle attachment. Start out on low until the sugar is mushed into the butter then increase the speed to medium-high for 3 minutes until the butter has lightened in color. Add the egg/vanilla mixture to the creamed butter/sugar and mix well. Add a third of the dry ingredients to the mix followed by a third of the buttermilk. Mix on medium-low until combined then add the next third of both flour and buttermilk. Mix again and add the last of the flour and buttermilk. Remove the bowl from the mixer, scrape the paddle and set aside. Scrape down the sides of the bowl with a spatula, add the chocolate chips and mix to combine. Split the batter between the prepared pans (a scale help). Use your spatula to spread the batter evenly across each pan. Bake for 30-35 minutes, rotating the pans half way through cooking. Before removing the pan make sure it is cooked through by either checking the temp. (it should be 210°F in the center) or, if you lack an instant read thermometer, the toothpick method (a toothpick inserted into the center of the cake should come out clean). Move cake pans to a rack and cool for 10 minutes. Run a knife between the pan and the cake, remove each cake from it’s pan and return the cake to the rack until completely cool. Frost with your choice of frosting, icing or whipped topping. I made a chocolate version of my regular buttercream frosting. I finally had a chance to make this in a 13″x9″ pan. Bake time was between 65-70 minutes. My plan is to skip frosting, serve it in the pan and dust it with a couple of tablespoons powdered sugar after it cools. This recipe is based on one my great-grandmother made regularly and which my siblings adore. While it seems to be a sort of Portuguese sweet bread has always been called bull in my family. It is a slightly sweet, anise flavored bread. It is assembled and kneaded the night before, left to rise overnight and then formed into small round loaves. Combine the flour, sugar, salt, anise seeds and yeast in a large bowl; set aside. Scramble the eggs. Continue mixing the eggs and slowly add a ladle of lukewarm butter/milk mixture. Repeat two more times to temper the eggs. Add the eggs to the remaining butter/milk mixture; stir to combine. Add the wet ingredients to the dry ingredients and mix with a sturdy spoon until just combined into a dough. Allow to rest for 30 minutes. Knead the dough until smooth, about 10 minutes. Place in a greased bowl, cover and let rise in a warm place overnight. Divide into 5 equal portions. Round each portion into loves and place in a greased 8″ cake pan. Preheat the oven to 350°F. When bread has completed doubled in size bake for 40 minutes, rotating pans half way through cooking. Remove from pans and allow to cool fully before cutting (if you can resist temptation). This bread also makes phenomenal toast.